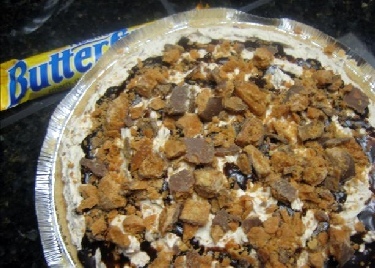 This easy butterfinger pie is so decadent and creamy. It will be a family favorite after the first bite. If you need to make a dessert in just a few minutes, this is the one. Family and friends will beg you for the recipe, and they will not believe how easy it was to make. It will be our secret. Freeze and place the candy bars in a resealable bag and crush with a hammer; reserving 1/4 cup for the topping. In a large bowl, add the cream cheese and whipped cream; mix well. Pour into the graham cracker crust and sprinkle with reserved candy bar. Chill for at least 3 hours before serving. NOTE: You may also used an Oreo cookie crust or crumbled peanut butter cream cookies for a crust. This is such a simple and creamy pie to make. The result is a dreamy luscious dessert for just a few minutes of your time. Not bad huh?